The crisis for Britain's savers is not being helped by the recent dip in CPI Inflation to -0.1% thus giving an excuse for Britain's banks to further CUT savings interest rates as the banks continue to effectively suckle on the teat of the Bank of England for cheap money instead of seeking funds from retail savers. Whilst the mainstream press continues to swallow Bank of England deflation economic propaganda as their focus is firmly on CPI if -0.1% for April 2015, and usually reported in ignorance of the fact that RPI, which is the closest thing to real inflation stayed put at 0.9% and is set against the demand adjusted UK real inflation rate of 1.4%. So in reality there is no deflation, and that's before one even considers house prices inflation which is galloping along at 9% per annum, so don't be under any illusion, recent deflation stories are pure economic propaganda. Instead my view as of March 2015 is that UK CPI official Inflation data for Jan 2016 will be at least 1.5% and RPI 2.5%. 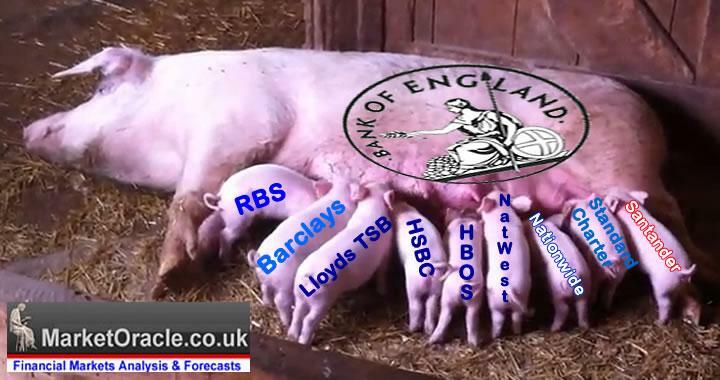 (25 Mar 2015 - Zero UK CPI Inflation Rate Prompts Deflation Danger Propaganda For Fresh Money Printing). So today's -0.1% deflation is very temporary, a flash in the pan, and so today's approx 1 year behind the curve deflation warnings in the mainstream press will instead a year from now be replaced with warnings of run away inflation as I expect UK CPI inflation to start taking off to stand at well above 2% by May 2016, with RPI at 3% whilst real inflation will be homing in on 4%. The table below further illustrates what has happened to cash ISA rates offered by apparently often reported on as best buy accounts of the tax payer bailed out Halifax mega-bank that in reality crashed in response to the Bank of England's Funding for Lending Scheme that started in July 2012. The table shows that the tax payer bailed out Halifax continues to across the board pay abysmally poor rates of interest. Having trawled many ISA issuers that like the Halifax typically offer less than 2% for multi-year fixes, the only bank that really stands out is the State Bank of India's 1000 day (2.77 year) Fixed rate ISA that pays 2.3%. Yes I know there are others that pay marginally more for a longer fix such as the Punjab bank 4year 2.5% fix where the problem is one has to visit a distant branch, for what? an extra £20 per year? And similar holds true for other providers with their obnoxious small prints. Obviously an indian bank, but what is important is that they are regulated by the FSA. Furthermore one CAN open an account online AND the SBI allows transfers in AT time of account opening. * 1% loss of interest for early closure i.e. effective rate of 1.3%. But what is not clear is that just for 1 year or does it apply to the WHOLE term. Commonsense would suggest it applies to the year of withdrawal only. If the account is closed before the end of the agreed term, interest will be paid at 1% less than the applicable rate of interest. For example, if the interest rate was 2.3% AER, an effective interest rate of 1.3% will be paid if the deposit is withdrawn or transferred before the end of the term. * A savings account is also opened, and the ISA is only available to those who DO NOT ALREADY HOLD AN SAVINGS ACCOUNT with SBI. * Minimum deposit is £15,000, Max £15,240. So what happens when one opens an account ? The whois public record apparently states the SBI savings application domain is registered to a James Sanders of Plan B Funding. Looking into Plan B Funding (http://www.pbfsolutions.co.uk) reveals that they provide online services for financial institutions and as well as State Bank of India list ICICI and UBL amongst their clients. The company is based in Manchester and dates back 2.5 years. Next - What happens when one opens an account? The online application process is pretty straight forward i.e. populate the online form with your details and on clicking submit are instantly given an account and reference number to fund. DAY 1 - No email confirmation of account opening. Opening deposit sent - No confirmation of receipt of deposit. 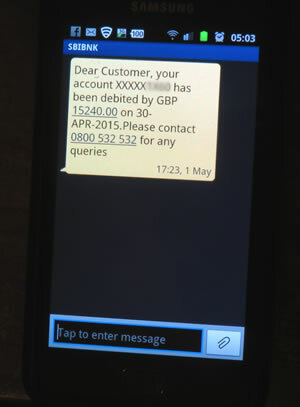 Day 3 - Cryptic text message stating £15,240 withdrawn ??? Day 6 - Nothing - Holding off calling their 0800 number. Day 7 - Nothing - Holding off calling their 0800 number. Day 8 - Nothing - Holding off calling their 0800 number. Day 9 - Letter stating SBI Online Instant Access Account Issue 4 opened. Day 10 - 3 letters - 2 passwords for online access and a certificate of investment. So in the communications department SBI rates very poorly, as I am sure many applicants by day 6 will be calling up the bank to find out the status of their Cash ISA deposit. So whilst 2.3% may be the best current rate for ISA savers, however a year from now, and despite the continuing Bank of England Funding for Lending scam/scheme, then similar best Cash ISA interest rates should be at least 0.7% higher. However, I will come back to the prospects for UK interest rates for 2016 in much greater detail in the coming weeks so ensure you are subscribed to my always FREE newsletter to get this in your email in box. The bottom line is to think hard and long before fixing for multiple years today, which means take early exit penalties into account as an important factor.